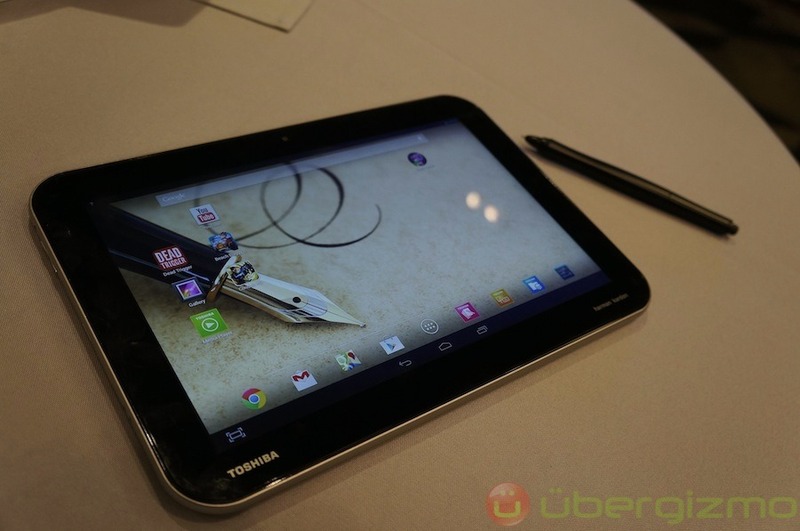 Toshiba has taken the wraps off three new additions to its Excite range of Android tablets here at the ongoing Computex 2013. Called the Excite Pro, Excite Write and Excite Pure, they are expected to hit the market in late June or early July. The Toshiba Excite Pro and Excite Write are both powered by the new NVIDIA Tegra 4 chipset, which makes these devices one of the first to feature the latest quad-core processor from NVIDIA. Both the Excite Pro and Excite Write are similar in terms of specs, with 10-inch IPS screens with a super sharp resolution of 2560 x 1600 on both devices. Both devices are also equipped with 8MP rear and 1.2MP front-facing cameras, 32GB of storage, Harman-Kardon speakers, micro-HDMI, microUSB and microSD card slots. The main difference between the Excite Pro and Excite Write, as the name suggests, is the inclusion of a stylus on the Excite Write. The stylus is capable of 1024 pressure points, putting the Excite Write head on against the Samsung Galaxy Note 10.1 tablet. Finally, there is the Toshiba Excite Pure, which offers – as the name suggests – stock Android 4.2.2. Inside, however, is a rather dated NVIDIA Tegra 3 chipset and only 16GB of storage. Rounding up the specs list is a 10.1-inch 1280 x 800 IPS screen, a 1.2MP front-facing camera (there is no rear camera here), as well as micro-HDMI, microUSB and microSD card slots. All three Toshiba tablets will run on the latest Android 4.2.2 OS, with the Excite Pro and Excite Write having a custom Toshiba UI skin on top. The Excite Write will retail at $599 (around RM1800), while the Excite Pro and Excite Pure will be sold at $499 (around RM1500) and $299 (around RM900) respectively.